Multiple features guarantee the highest performance. 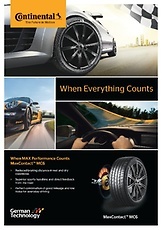 Dedicated areas on MaxContactTM MC6's tread design are responsible for the high performance of the tyre. 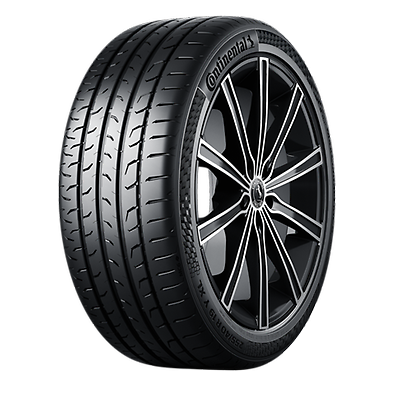 These features cover all four directional forces that are applied to the tyre tread. Fix and stabilise the outside shoulder blocks and the longitudinal rib to form one stable unit, for enhanced handling and cornering grip. Depending on the dimension, there are about 50 Stabiliser Bars positioned around the tyre's circumference. The supporting angles of the rib-shoulders prevent slanting of the ribs under heavy cornering manoeuvres and sharp changes of steering direction, thus ensuring an enhanced cornering response. Prevent the rolling-in-effect of the ribs in the lateral direction for maximum contact area to achieve enhanced cornering grip and stability. Performance designed Chevron Grip Elements allow even pressure distribution during cornering even on the inside tyre of the vehicle resulting in enhanced grip, better wet braking and handling. To achieve faster dry braking and efficient traction for acceleration, these longitudinal ribs are engineered to avoid block distortion by transferring circumferential forces efficiently to the road. Breaks down the noise waves which flow through the grooves to ensure a comfortable low noise ride. Meets the extreme high grip requirements of the driver. The special adhesive polymers within the MaxContactTM MC6 compund are specifically designed to accomplish the exterme high grip requirements of the driver. Continental is a technology leader in compounding. For MC6 we took all levels of traction into account to reach maximum grip under all conditions. Acts on a mm-scale (millimetre), assures primary contact to the road and interlocaks the tread of the tyre to the road's surface on a mechanical level. Acts on a µm-scale, generated by the deformation of visco-elastic materials on a micro level due to surface roughness or stick / slip movements of the tyre while driving. ​Acts on a nanometre-scale, superior adhesion to the road surface created by molecular forces - based on the 'Van-der-Waals-Forces" - which bonds the polymers to the road surface on a nanometre level. Reduce tyre flexing to bring handling and high-speed stability to the next level. The stiffness of the Xtreme-Force ply material of MaxContactTM MC6 reduces tyre flexing during hard cornering and at high speeds providing maximum control and better handling. At lower speeds or less sporty driving, less force are applied to the tyres. In such cases, the Xtreme-Force ply material is still flexible enough to ensure a comfortable ride in the comfort zone area, while a standard tyre would be not that flexible. In the sporty zone, the Xtreme-Forece ply material causes MC6 to be more rigid which provides a direct feedback to the driver. A conventional ply material would be flexing much more which reduces the feedback in cornering and steering at high speeds.